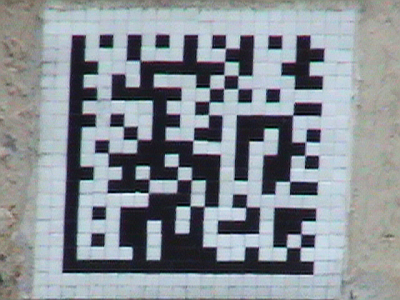 OK try and follow this: French street artist, Invader, creates low tech art with a retro digital look and encrypts some of the pieces with coded messages, which require high tech devices to read. Oh, and he posts most of his work outdoors, with no authorization, in cities all over the globe. Invader explains it all in this interview courtesy of jetsetgraffiti.com. This dude is serious about his outlaw status. He does the entire interview wearing a welding helmet. Click here for another hint. Good luck! I know that corner but I live in L.A. Won't be in N.Y.C. any time soon either. What's this 'fabulous prize' anyway? The prize is a surprise. And it's musical.